This recipe is not the ordinary chicken curry dish. The chicken is coated with soy sauce and cornstarch first, then fried in cooking oil. After that, it is cooked in a curry sauce. If you are looking for a chicken curry with a twist, then I think this is a great recipe for you. This dish can also be a good rice topping. 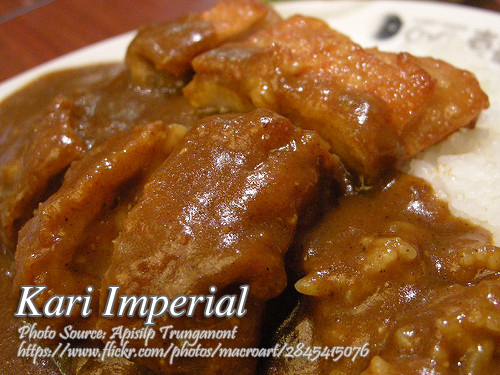 To cook kari imperial; Roll chicken in a mixture of soy sauce and cornstarch. Fry with enough cooking oil until golden brown. Sauté green onions and curry powder and stir well. Add fried chicken. Mix. Add water chestnuts and chicken broth. Thicken with cornstarch diluted in a small amount of water. Decorate with ham and green onions. To see the complete recipe with list of ingredients in exact measurements, continue reading.